If it's Friday, it must be Offal of the Week! Brought to you by Ryan Adams, author of the blog Nose to Tail at Home, each week we highlight a different part of the animal that you've always wanted to make, but were afraid to ask your butcher for. This week: Hog's Head. Thanks to the proliferation of supermarkets, it's easy for people to forget that the meat they buy in the little styrofoam containers at one point was actually attached to a living, breathing animal. The fourth wall comes crashing down the very second you start working with a decapitated head, but it's so very worth facing that reality. With just one hog's head, you'll find yourself standing in the middle of a playground of culinary opportunities. When cooking with a hog's head, it's important to take stock of all the possibilities that open up to you: Not only are there two wonderful but tough cheeks that are laden with copious amounts of fat, but two ears, a tongue and if you care to work at chipping through the skull, a brain. On top of all of those goodies, a boiled head will result in a massively flavorsome stock filled with plenty of gelatin. One word of warning though: I've worked with a fair share of pig noggins, and once the flesh starts falling from the bone it's tough to ignore the fact that you're dealing with an animal's skull. It's the most gristly chore I've ever tackled in the kitchen. Pig heads can be found in various ethnic markets—Latino and Asian are your best bets—or your always handy local butcher. You might also try checking out the nearby farmers market, though the odds of stumbling upon a freshly-butchered head just staring at you are a bit slim, so you might want to order ahead [zing! –Ed.]. I've run into some farms that specialize in heirloom hogs and they're always willing to dole out the good stuff, though it can be pricey. Look for a whole head with all the bells and whistles—ears and cheeks, of course, and ideally the tongue as well—and smooth skin that may or may not still have hair on it. If you do happen to buy a hirsute hog head, you can shave it bare with a disposable razor or burn the offending whiskers away. Very interesting offal posts. They cut off only the fins of sharks and throw the animal back in the water for it to sink and drown. Why not look at ways of eating more of the whole animal and finding good recipes instead of wasting it. "If you're going to kill the animal it seems only polite to use the whole thing." You couldn't have gone for a better choice. I had pig chaps at St. John's, UK (you probably know about it), and it was one of the best cuts I've ever tried. Loved the website, quality food reading which is hard to find around. congrats. Lord (or rather, Lard!) your posts make me happy on a weekly basis and this may be my favorite yet. I've recently smoked a cow head for barbacoa tacos, but haven't seen many other recipes. 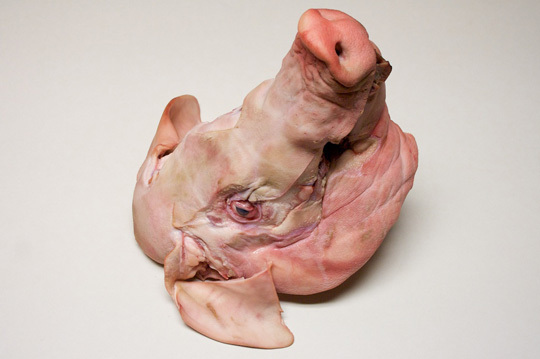 Can one sub cow head 1:1 for pig head in recipes, or is there a fundamental cartilage ratio that changes things? The cow's jawbones, by the way, made fabulous stock. Kat, I honestly don't know the answer to your question. I wish I did though, that would be handy knowledge. Now I'm curious too. The only problem is that I don't have a big enough pan for a cow's head!